As more companies adopt marketing automation tactics, you might expect that they are sending more emails; not if they’re doing it right. Some marketing automation software solutions have email engagement tools that enable better targeting and more effective email marketing. Not only does this improve your success and increase your ROI, but it also helps to maintain a good sender record. The objective is to send relevant information and offers to those who will be most appreciative; and now there are more tools to hone that implementation. For example, SharpSpring introduced engagement-based monitoring and suppression tools late last summer. It assigns a score (from 0 to 16) to contacts, and that score changes automatically depending upon a contact’s actions (or inaction) with respect to your emails, forms, website and social media. If a contact reduces to a 0 score, they are deemed to be unengaged and are prevented from receiving emails. Their score will be automatically increased if they send you an email, visit your website, submit a form or download content. May sound harsh when many organizations want to get their information in front of as many people as possible, but this strategy has your success as its focus. Although it may seem counterintuitive, smart email suppression makes for more successful campaigns. To get a sense of how effective smart email suppression is, SharpSpring studied emails sent by 5,000 of their clients. Their analysis was done three months after they implemented engagement tools and automated suppression controls. It compared the month of September 2017 with September 2016. They found that the overall number of emails sent dropped by 30 million. 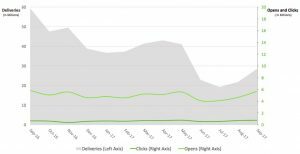 However, as the graph below shows, both opens and clicks increased — dramatically fewer emails sent, but more opens and clicks generated. To further illustrate the impact of strategically suppressed email delivery, the following chart normalizes the results for 1,000 email contacts (from this same study). 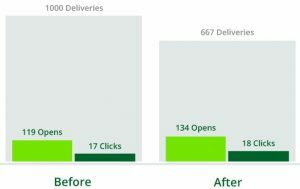 The engagement tools allowed only 667 emails to be sent, but those emails generated more opens and clicks. Another major benefit to employing email suppression is maintaining a good sender status. Big ISPs (e.g. Google, Microsoft, Apple, Yahoo) have included engagement in their algorithms for designating email as Junk or Spam. Keeping your delivery rate high with email suppression helps to maintain a good sender status, facilitating favourable delivery by the major ISPs. The best designed emails are worthless if they don’t make it to recipients’ inbox. The example shown in the chart above eliminated the possibility of any of the 333 unengaged prospects to become annoyed, and possibly file a spam complaint. As you’d expect, email marketing for most organizations involves e-newsletters, promotional offers and simple auto-responders. An obvious starting point, but certainly not sufficient to sustain a highly engaged database. These email initiatives should form part of a larger strategy that includes content of interest and meaningful ways for prospects to engage with you. (Remember, inbound marketing focuses on earning a prospects interest and trust, so using email to simplu push out your promotions is not a sustainable model.) You should start with a thorough understanding of your prospects and customers, analyzing the journey they take in dealing with you, and determining where, how and when you could most effectively communicate with them. You’ll reap greater rewards by using a more strategic approach to your email campaigns, ideally integrated with structured automated marketing tactics. In addition to email suppression, companies striving for best practices are also using personas, buying cycles, behavioural and list segmenting, dynamic content, and planned workflows to nurture and engage their audience. It’s worth noting that with the increasing use of content and emails as a distribution channel, there is a corresponding increase in unsolicited emails. It is important to respect CASL legislation in Canada. Not only because it’s the law and good business etiquette, but dumping a bunch of emails on people who likely have no interest in your services is not a good growth strategy.